Little A was feeling really sad and lonely on Monday because his sister was in a school camp. Being the youngest one in the family makes him so attached to Big A. They are very close to each other although sometimes they are also like other kids ... They still fight (not physically though) and often argue about something and nothing. Hubby is still in his business trip to Argentina, so only me and Little A at home on Monday. He had an exception to sleep in my bedroom. Big A returned from the school camp yesterday evening. I know Little A couldn't wait to see his sister because he kept asking when she would come back. Big A, on the contrary, was pretty excited about her school camp. She already made a check list for things that she should bring from many days ahead. I kept telling her so many things for her to remember that I wasn't sure she would remember all. Just me, as usual, being worried about her sleeping outside from home for the first time. The school camp was kind of ritual for Grade 6 students as they will have the Government exams in few more months. So this camp was about motivating and boosting their confidence. Hopefully, they all can give their best to do the exam. I hope Big A will really get the benefits and purposes of this camp. Inside the box : rice, stir fry veggies, and braised soy chicken with baby potatoes. Aw, so sweet that your kids are so close to each other and miss each other! Happy for you too, that your two kids are home with you now. Hope their daddy comes home and makes the family complete very soon! I bet Big A will miss her little brother too..
@Bobo : Hope the kids can keep their closeness until they are big and old. Thanks Florence! @prince n princess mum : Thank you dear! Lil A is so sweet missing his big sister! It is nice that family is going to get together again soon ^_^! Hope Big A succeeds well on her tasks! It seems she is very busy this year with school... she will sure manage with all the love and support from you all. 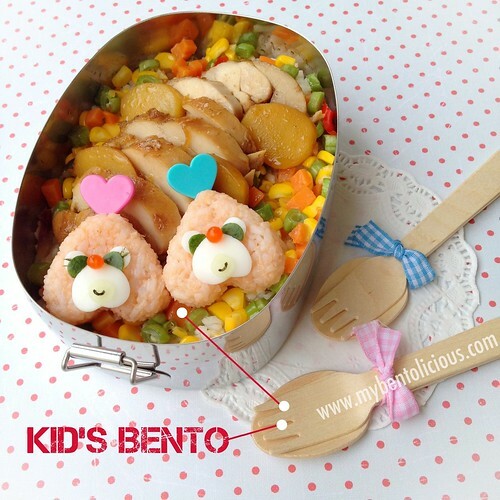 Lovely bento today, cute characters for your lil boy! @OhayoBento : I hope the same too. I'm not really into the camp things but funny because I met my husband in church camp hahaha ... Thanks Heather! @karaimame : Thanks a lot Lilian! Last year in elementary school, sure she has a lot of works to do. Pressure ... pressure, oh boy! Awww... hope Lil A is feeling better without his sister. Even my kecik one also miss her brother when he goes to school. She will ask for him when she wakes up from her nap. Yummy and cute bento as always Lia! @MakanMasak : Thanks a lot Henry for visiting my blog!